Ghost or Ghost BC released their debut full length album ‘Opus Eponymous’ in 2010. Since then, they’ve been referred to as the torch bearers of Doom metal – after the torch passed down from Mercyful Fate. For those new to the band, Ghost are known for their eccentric stage presence. The vocalist performs in a skull mask and cardinal outfit and is known as Papa Emeritus. The other 5 band members wear hooded robes throughout the performance and are referred to as Nameless Ghouls. Clearly, the band takes pains to be distinguishable. Infestissumam is Latin for ‘hostile’. I couldn’t help but look that up so I’m just putting this knowledge out there. Ghost is a band that mainly plays on occult themes. Not surprising, the licks and atmosphere carry a very obvious Blue Oyster Cult influence whereas riffs and lyrics and similar to those of Mercyful Fate. This style works very well on Opus Eponymous but on Infestissumam, not so much. The album starts off low and stays there for the most part save for an occasional resurface. The band does a lot of 70’s style heavy metal and also has some other stuff going on that you’d like to call Satanic but it just seems more like a parody on Satanic heavy metal. Most songs are between 4-6 minutes in length. Jiggolo Har Megdido is based strongly on drum stomps as is Body in Blood. Per Aspera Ad Inferi is the most “metal” song and is the only track to digress from the slow tempo of the whole album. Year Zero is undoubtedly the best track on the album and combines everything that Ghost is known for – the soaring chorus, an exciting intro (remember Con Clavio Con Dio?) and neat verses. The chants and chord progressions are brilliant and not overdone so as to bore the listener. Ghuleh clocking at slightly less than 8 minutes is the second decent song here. It starts off slow and haunting but picks up midway among delighting drawls of “Zombie Queen/ Black light guides you/Ghuleh/Ghuleh.” It manages to sound cool right till the end. Tracks like Idolatrine and Depth of Satan’s Eyes are barely where they need to be but it’s undeniable how neat the instrumental parts are. The production is good overall. Not to write off Ghost but it remains to see how far they go on their onstage gimmick and 70’s rock worship. What annoys me about this record though is that there are none of the depressing, soul crushing vocals that are synonymous with doom. You might as well picture the band smiling throughout but you can’t because HOODIES. Maybe Ghost are trying a demented happy style but I’m not too convinced of this aspect to excuse it. The must-hear tracks weren’t too difficult to choose – Year Zero and Ghuleh. With a band like Ghost, you just expect more – heavier, evil, depressing metal. Infestissumam fails on every account and ends up sounding like a Blue Oyster Cult nostalgia trip. I hold this album in higher regard personally but can appreciate your perspective here. Ghost have, for the most part, abandoned the few metal elements they had on their debut album so now they’re almost like a psychedelic hard rock band with a metal/horror aesthetic. No less, if someone is looking for something like Candlemass’ Nightfall they most certainly won’t find it here. 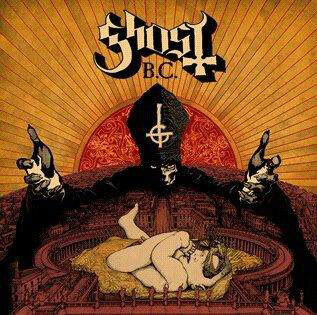 I’ll agree that it grows on you after a few plays but I think Ghost just set a high standard with Opus Eponymous. I definitely don’t think they’ll be doing anything heavier after this, so yes your description is quite apt.